I didn’t intend for this to be a 40k heavy blog, but that’s just what has been dominating my hobby time lately. 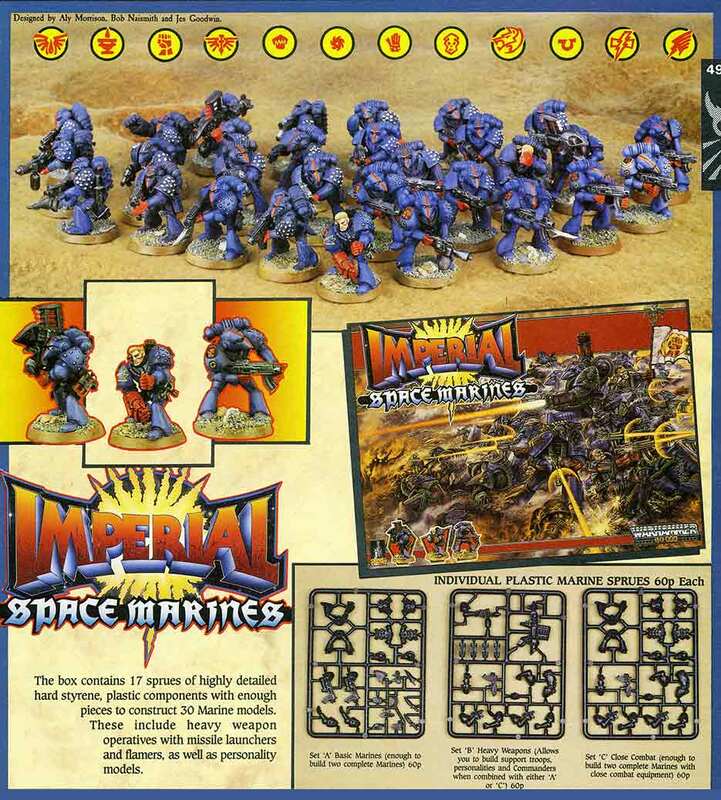 That said, I’ve a long and moderately colourful history with the RTB01 Imperial Space Marine box. It was tremendous value at the time and I had two of them, sort of. Offsetting their awesomeness was the fact that back in the Rogue Trader days (before the shadow of grimdark blanketed the entire universe) they only had Toughness 3. Even with my relatively decent memory, I have no clear recollection of acquiring either box. A couple of years back when I was cleaning out my stuff from my parents place back in NZ I came across a letter written from a kid at school who had left for the wilds of Papua New Guinea as part of his parent’s mission. Tough gig I guess. It turns out, he’d asked his parents for a box of these figures and ordered them through another school friend of mine. My friend would give them to me, I’d paint all thirty and dutifully send them back to PNG for him. At age 14 even the most disciplined child is going to struggle to paint 30 marines in a single colour scheme, and I was far, far away from being the most disciplined child. 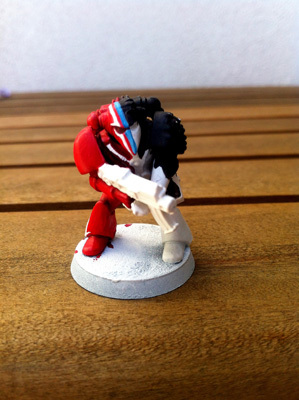 I could barely paint two marines before deviating into some other sudden influence. I was learning, I was experimenting! And then I must have forgotten about the whole thing. I had no further correspondence with the kid in PNG, the Marines ended up permanently in my possession and I thought no further of it. That is until I found the letter – and I felt suddenly guilty about the whole thing. So I looked the kid up on Facebook – and let him know about it, and apologised. He never replied, maybe he ignored it, maybe he didn’t give a damn any more. I did a bit of stalking (as you do) and it turns out he had an extra role in the Fellowship of the Ring. 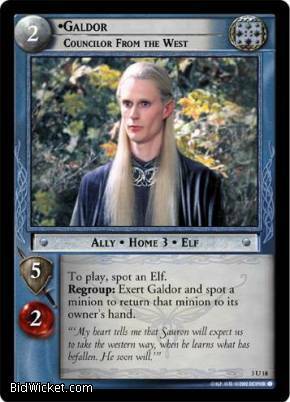 This is the FFG LCG card for him – he sat next to Legolas for a bit. 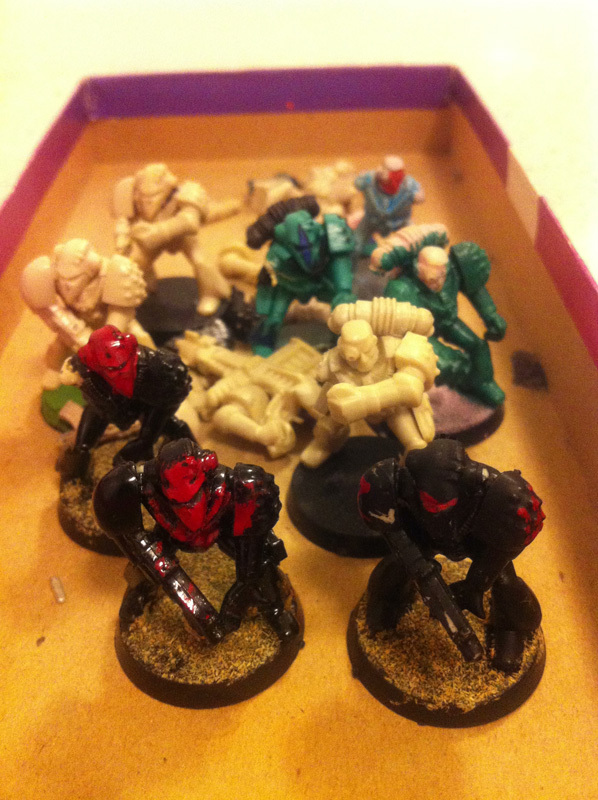 So, when I was a kid I ‘stole’ Galdor’s marines. Anyway, only a few remain now, most lost to the winds of childhood trades and ebay. These guys, sitting in a Grenadier Fantasy Lords box are due for a bath. GW has committed many crimes against gaming over the years, but the fact that the Marine Tactical squad remains pretty much intact since 1987 is worthy of note. 10 men, 1 missile launcher, 1 flamer, 1 sergeant – OK so no chainsword but its a small concession. Please note that I did not paint the three abominations in front. Teal – yes, I’m guilty of that. The final surplus piece that’ll make up my off-cut Marine force is a 2nd edition land speeder, caked in the same manner as the Assault squad and Terminator. Its a superb model, although the stripping process has reduced it to 12+ components and its going to be a project just to put it back together. 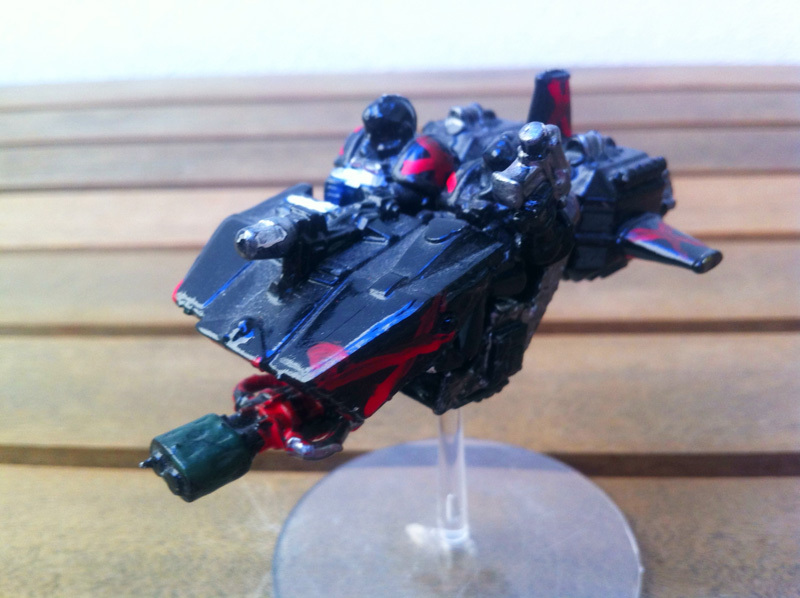 I rather like the TIE fighter pilot appearance of the gloss black enamel, I think I’ll replicate it. Teal is what happened in the 90’s. US expansion sports teams, and those undergoing a re-brand during that mostly tasteless decade frequently explored virgin territory in the land of uniform colour. Conventional claims to red, blue, black, green & gold had already been well staked, a new team needed a fresh new colour to strike an original pose. 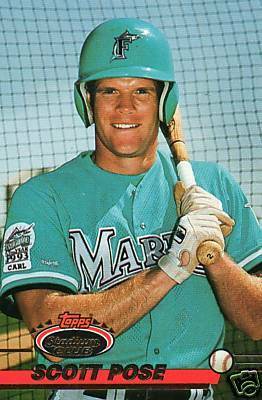 In the early 90’s that was teal, and if it wasn’t teal it was purple. 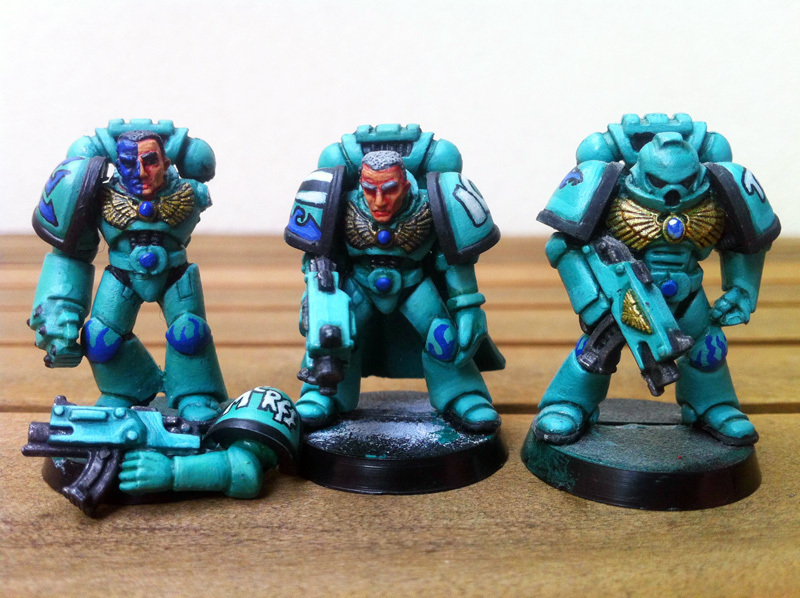 Since I am old enough to have been painting in that dismal era, I was similarly afflicted with teal-affinity for a while, and these marines have been my lasting 20 year legacy. Until now! So I’m taking a parting shot of these guys before they hit the bath. They’re an Ultramarine knockoff “Aquamarines” which is a bit like comparing Superman with Aquaman. It seemed a good idea at the time, and at least I didn’t get sucked into the wretched music of that era (well, mostly). 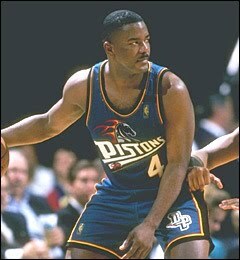 The marines have their names on the left shoulder, they are McRiff (Fred McGriff? Professor Griff? ), Ice (gulp) and Toni (Tony,Toni,Tone). 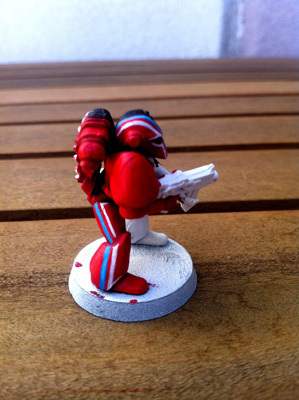 An old RTB01 Imperial Space Marine that is part of the 2nd Tactical squad of my “army”. Beakies are a good basis for experimentation, plenty of flat surfaces. I’m rather pleased with this scheme, busy on one side plain black on the other. I don’t know what I’ll call this outfit, but the half black could represent the death of a twin or something like that. Something to think over. A quick progress shot on a gloomy Melbourne saturday. The assault squad is now pretty much clean and ready for painting. Now I have to think about a Chapter colour scheme – one without blue or yellow (even though deep inside I know it would look good). The barista in the cafe across the road from my work is a 40k player. 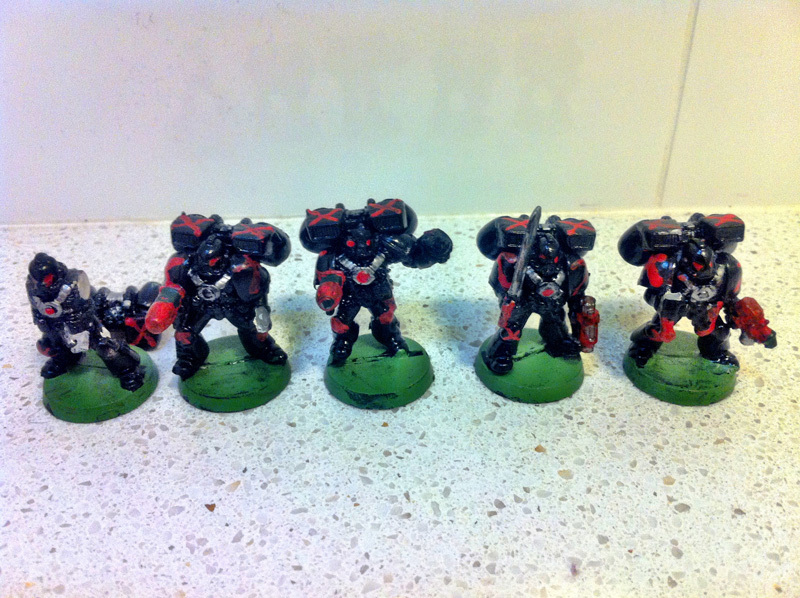 Marty has been kind enough to donate (for a very small sum) some Space Marines that are ripe for a minimakeover. I don’t actually play 40k, but I’ve had the bulk of an army since the Rogue Trader era. The basic config of a marine army hasn’t changed much in 25 years so most of what I have is pretty relevant today. That said I didn’t have an assault squad, which is where these guys come in. These are the 2nd crustiest miniatures I’ve ever laid eyes on. 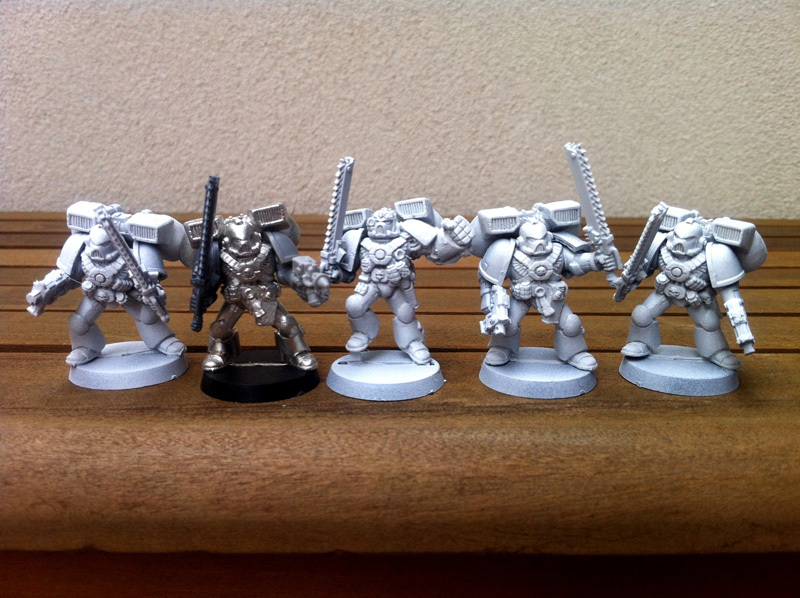 They’re not really marines, more like tar babies with an enamel coating. 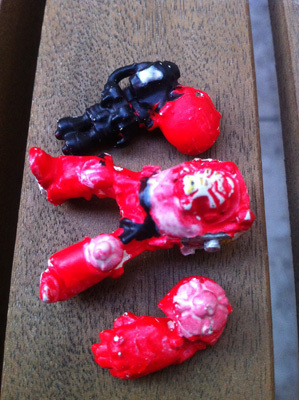 The arms are shot, there’s no way to strip them, but the bodies and jump packs are perfectly salvageable. Apparently Marty picked them up in an ebay bulk auction, I’m expecting the price was not high. As a bonus he tossed in this guy, THE crustiest mini ever. 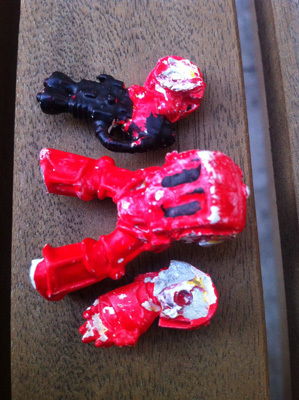 The rough outline indicates a terminator with a heavy flamer, we’ll see. The back vents are so thick with paint they’re barely even recessed any more. What a delight!